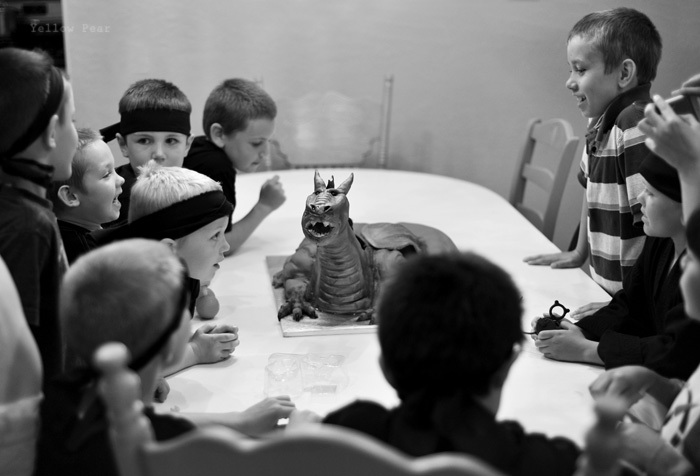 I had so many other plans for Dennis' 7th birthday party, but with our last minute trip to Washington and then the end of school and summer vacations and plans, I didn't get to do all I had wanted, but really, Dennis was super excited and loved all of it, which is all that really matters. 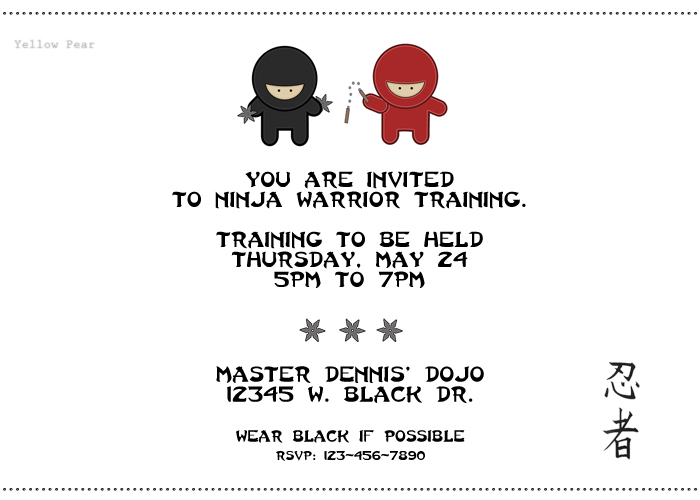 For the invites, I had a blast creating ninja figures and then Dennis helped me make nun chucks and throwing stars. 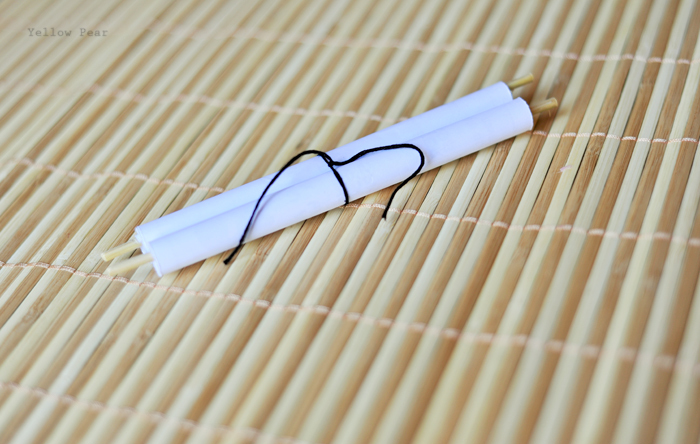 We printed them off, glued some skewers to the end and rolled them up like scrolls. 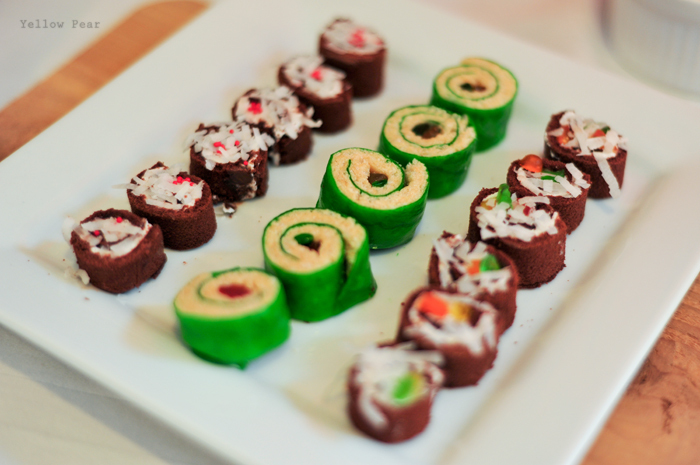 For food, I made dessert sushi out of rice krispie treats, fruit roll-ups, gummy candies, Swedish fish, coconut and sliced pieces of Swiss rolls. They were so fun to make and they boys got a kick out of them. We also had pot stickers that my hubby painstakingly pan fried (they were delicious), edamame, Swiss roll nun chucks and sesame noodles using this recipe. I also had a big pitcher of red koolaid that was meant to be Jujutsu juice, however 10 minutes before the guests arrived, Q spilled it EVERYWHERE. I was already panicking due to lack of time and it did not help matters one bit. Days later, we were still finding red koolaid inside the cupboards, on the floor and on the contents inside the cupboards. I made giant paper lanterns out of red poster board and a Happy Birthday poster written in Japanese (that should have been much cooler, but seriously I printed it out 20 minutes before the party). Also I had it hanging upside down for much of the party. It is pictured right-side up though. 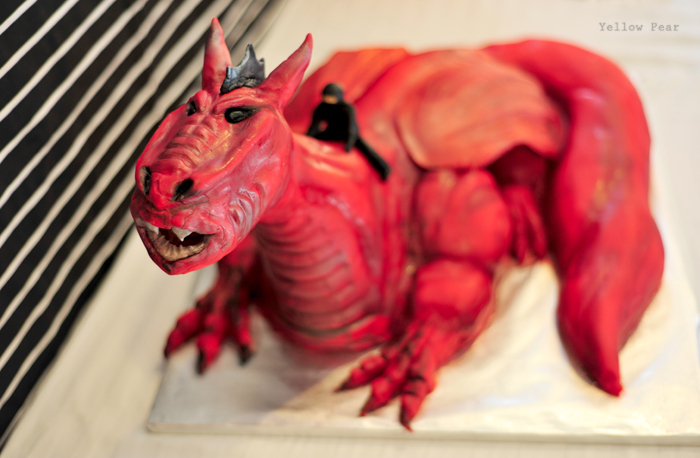 My friend made this AMAZING dragon cake! The detail was breathtaking. It was sooo cool. And heavy. We were blown away by it. She even built it with PVC pipe down the throat so that we could add dry ice and water and have smoke come out of his mouth. Everything was edible...the wings, the ninja, everything. It was lemon cake with raspberry filling and buttercream. And so it was delicious as well as amazingly cool. And HUGE. 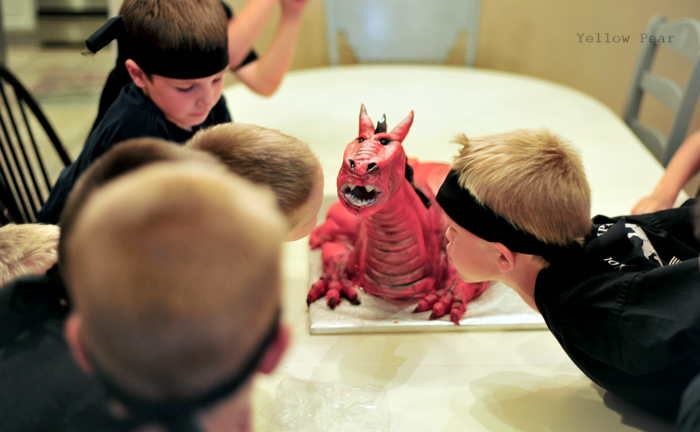 We ate that dragon forever. 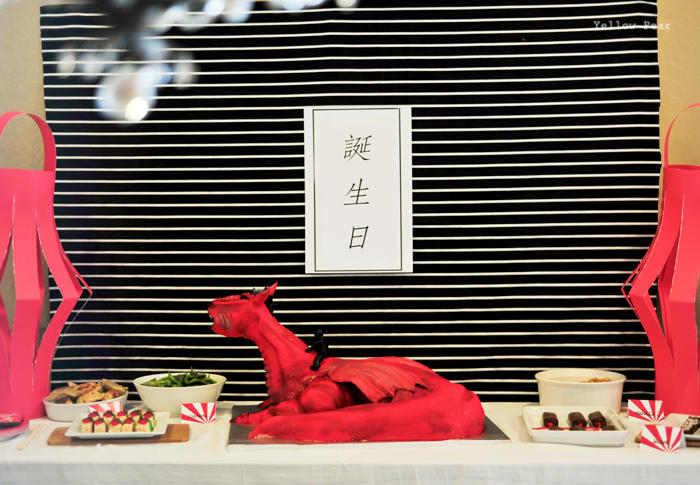 The tail alone fed the entire party. I was extremely stressed as the party was starting because two of my activities were not working and I didn't have time to fix them, red koolaid was everywhere, the food wasn't completely cooked and various other hitches, so I had resolved to forgo the dry ice. When my husband learned of this, he replied, "We HAVE to do the dry ice, that is the coolest part. I will go get it. It has to be done!" So off he went to three stores to pick up more red juice and some dry ice and it was very worth it. I am so glad we did it. The boys loved it and frankly so did the adults! For activities, we started by practicing the art of ninja disguise. 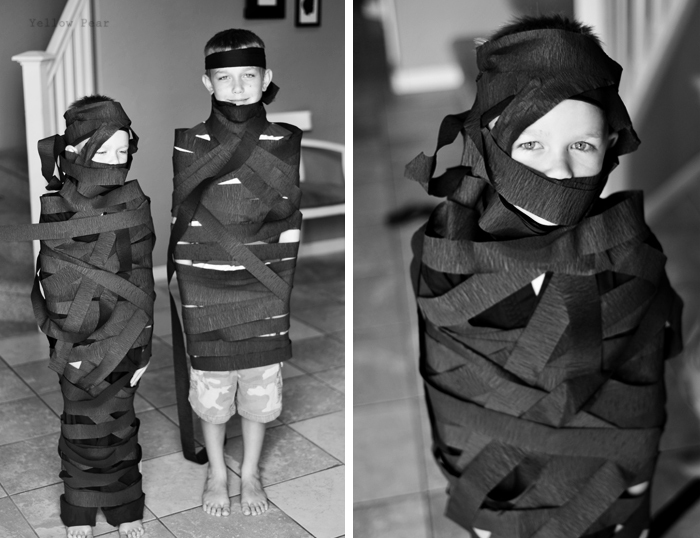 I broke the boys into two teams and gave them each a roll of crepe paper. They took turns and helped each other turn Mr. C and Dennis into crepe paper ninjas (they looked a little more like black mummies than ninjas, but gosh, it was funny). We practiced precision and patience by frosting sugar cookie "shuriken" and trying to keep frosting from spilling out of the middle hole. 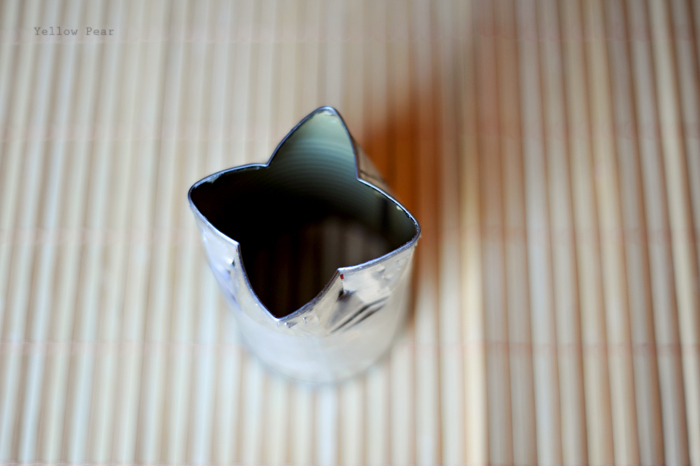 I made a cookie cutter out of a tin can because I didn't want to spend the money on a ninja star cookie cutter. I was pretty proud of myself. We practiced meditation and agility by practicing karate moves. The boys were hilarious. We had a competition to see who could hold the crane stance the longest. I talked to them before about clearing their minds and focusing. You wouldn't think a bunch of crazed ninja-fied seven-year olds could do that, but they did and they were determined. Afterward, one boy told me he had fixated on one spot, one blade of grass to help him focus. Amazing. 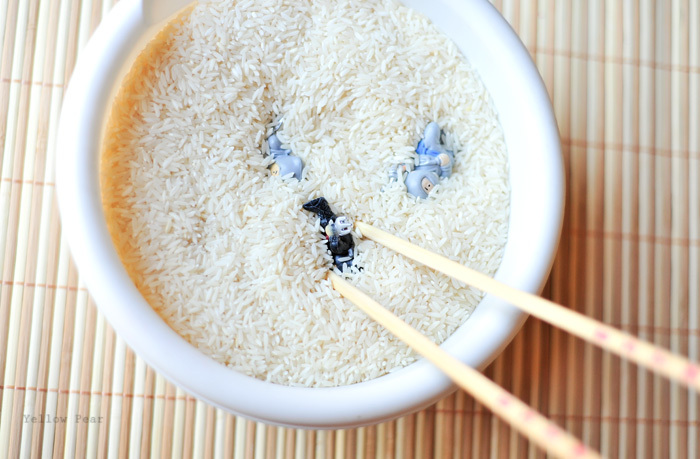 We practiced dexterity by using chopsticks to retrieve tiny ninjas out of rice. I thought this would take longer than it actually did. Among other things, I forgot about candles, but the dry ice was perfect for blowing! Even though you can't really see it in the picture. 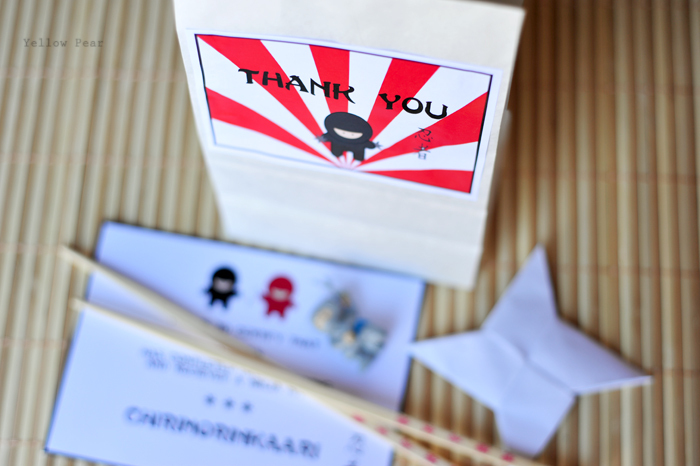 For favors I was going to make all of these cutesy ninja items and then finally figured it wasn't worth it. 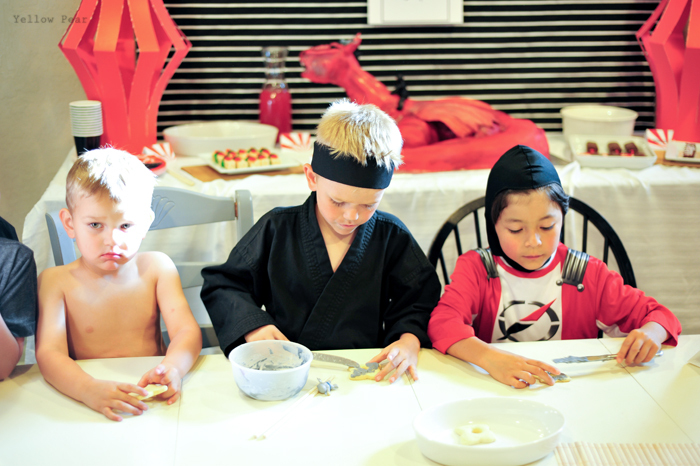 Would they really play with and cherish a handmade ninja that I had slaved for hours over? Probably not. 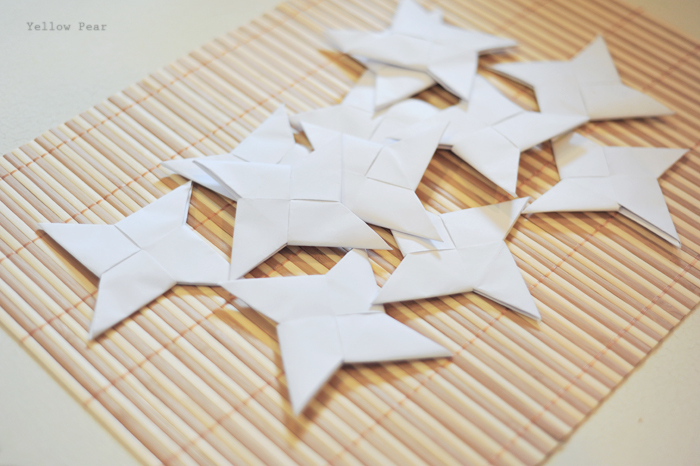 So I figured some origami ninja stars (that Dennis and I made), a little ninja toy, a pair of chopsticks and a ninja award were good enough. 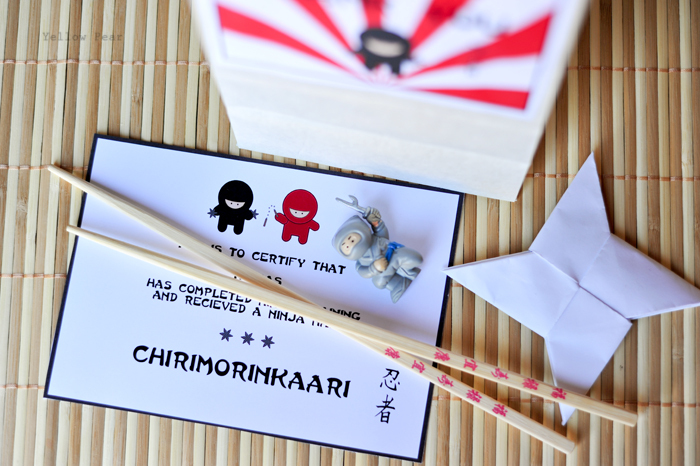 I used a ninja name code to convert everyone's name to their ninja name and presented them with their certificate as they went home. The names were so great. 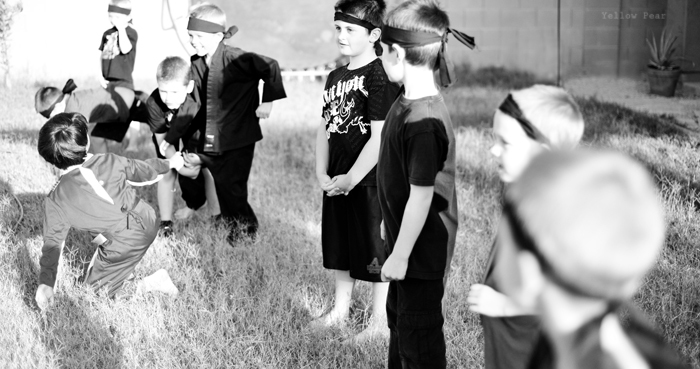 And let me tell you that having a ninja party for young boys seems to make them all that much more active and full of energy and punches/kicks/karate chops, etc. Phew. I was tired after. 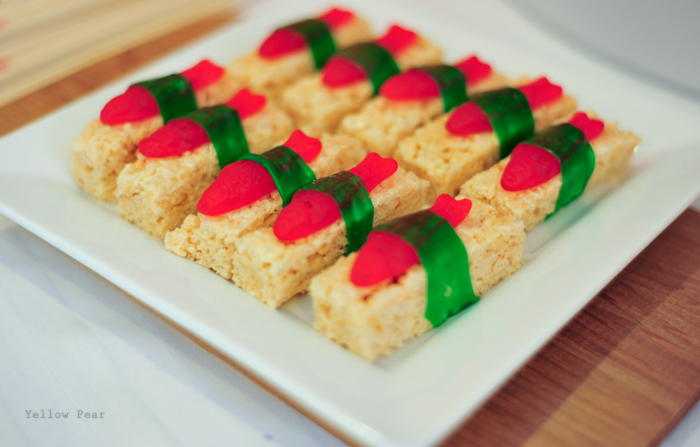 That sushi looks like something I could actually eat! Did I ever tell you that someone bet me $1000 (yes, one thousand dollars) to eat a sushi roll. It was actually not bad, minus the nasty raw fish crapola inside. It tasted like something I can't mention on your blog. But I choked it down!! And that dragon is freakin' awesome, dude! Looks great! 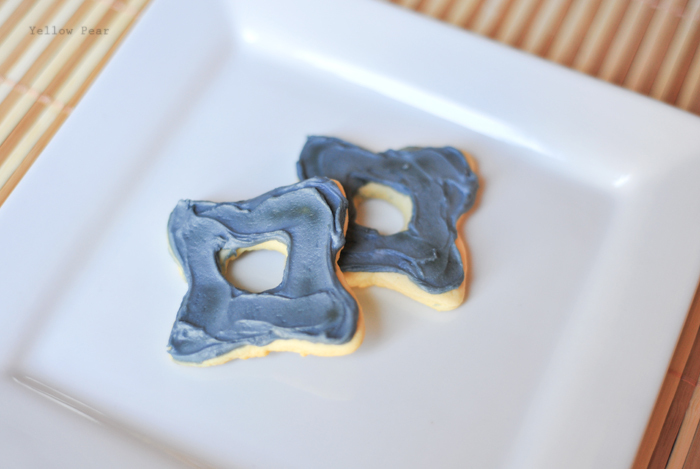 I love the improvised cookie cutter! 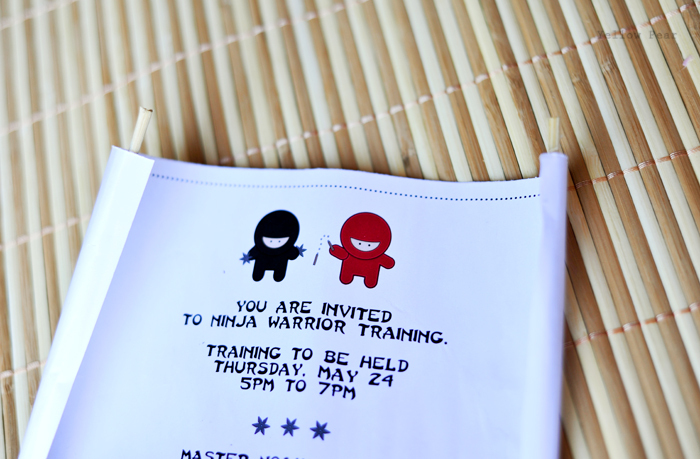 Your ninja men on the invite are so cute!! They look like they took you a long time to design! And I love the ninja disguises! Wow! Pretty amazing. Looks like a ton of fun. 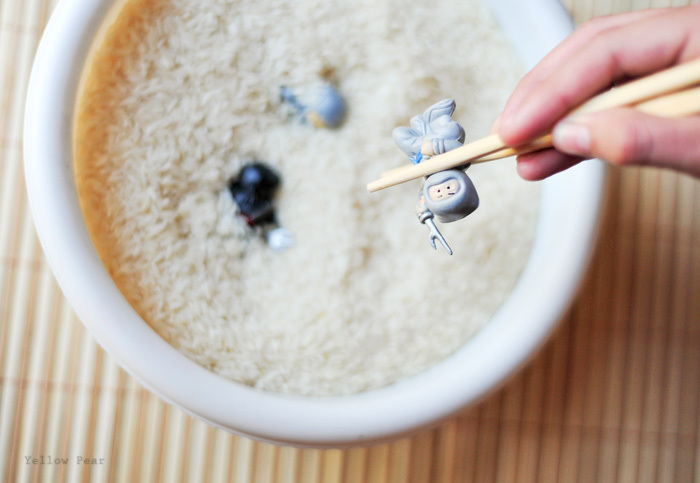 The sushi is so cute & love the cake!